“By means that could be termed dishonest, deceitful and corrupt, they manufactured 7.2 billion euros in deposits by obvious sham transactions,” Judge Martin Nolan of Ireland said as he convicted three top bankers on Friday for their role in the 2008 financial crisis. They are among the first in the world to be sent to prison for their involvement in the global meltdown eight years ago. The longest-ever criminal trial in Ireland lasted 74 days and led to convictions for former Irish Life and Permanent Bank Chief Executive Denis Casey; former finance director at the failed Anglo Irish Bank, Willie McAteer; and former head of capital markets at the Anglo Irish Bank, John Bowe. They received sentences ranging between two-and-a-half to three-and-a-half years. 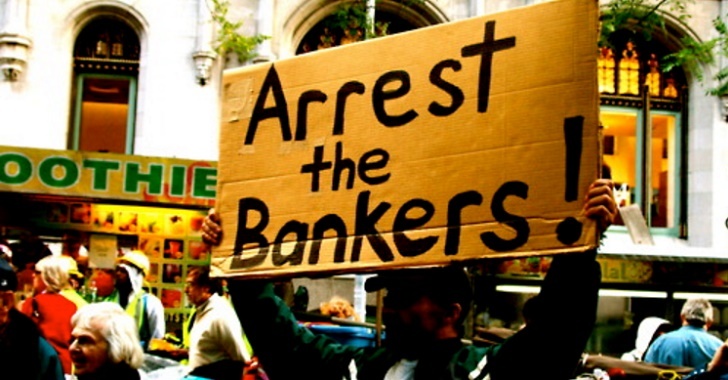 As light as those sentences may seem considering the dire effect bankers’ actions had on the Irish economy, U.S. and English bankers have evaded convictions altogether. Though banks in those countries have since paid out billions of dollars in settlements to regulators for their role in the 2008 crash, no one from those companies has been sentenced to prison. “All three were convicted of conspiring together and with others to mislead investors, depositors and lenders by setting up a 7.2-billion-euro circular transaction scheme between March and September 2008 to bolster Anglo’s balance sheet. “Irish Life placed the deposits via a non-banking subsidiary in the run-up to Anglo’s financial year-end, to allow its rival to categorize them as customer deposits, which are viewed as more secure, rather than a deposit from another bank. But Judge Nolan maintained they had committed a “very serious crime,” adding, “The public is entitled to rely on the probity of blue chip firms. If we can’t rely on the probity of these banks we lose all hope or trust in institutions.”A blue chip firm is a “nationally recognized, well-established and financially sound company,” according to Investopedia. Nolan also called Anglo Irish“‘probably the most reviled institution in the state,’” noting it was “put into liquidation in 2013 and remains subject to other criminal trials,” Reuters reported. In recent years, the Irish population has grown increasingly angry over the lack of prosecutions for financial dealings that cost taxpayers “64 billion euros — almost 40 percent of annual economic output — after a property collapse forced the biggest state bank rescue in the euro zone,” Reuters noted. By 2011, Irish taxpayers had bailed out banks five times, and the Irish finance ministry said last month it could take up to 15 years to recoup the money pumped into those banks. Willie McAteer, the former finance director at Anglo Irish, was previously convicted of “illegal lending and providing unlawful assistance to investors,” in 2014, but he was sentenced only to community service after a judge ruled he was “led into error and illegality” by Irish regulators. Two top bankers from Anglo Irish Bank — chief operations officer Tiarnan O’Mahoney and former company secretary Bernard Daly — were convicted and sentenced in 2015 for crimes that preceded the 2008 crisis, but both were releasedfrom prison on appeal earlier this year after spending several months behind bars. O’Mahoney could still face a retrial. The government’s lenient treatment of O’Mahoney and Daly leaves uncertainties regarding whether or not this week’s convictions will translate into actual prison time for the bankers or an upheaval of the current system; the Irish financial system’s corruption extends far beyond the activities of the recently convicted bankers. Similarly, Iceland, which received widespread praise last year for sentencing over two dozen bankers to prison for their role in the global banking crisis, released three of them in April — years before their sentences were officially up. In spite of the questions surrounding whether or not convictions like those issued Friday will produce tangible change, the symbolism of bankers actually being held accountable for the destruction caused by their schemes is sure to resonate with Irish citizens, as well as observers from around the world. Meanwhile, in America, the political party vowing to end the banking oligarchy held its convention at the Wells Fargo center for a candidate bankrolled by Goldman Sachs.